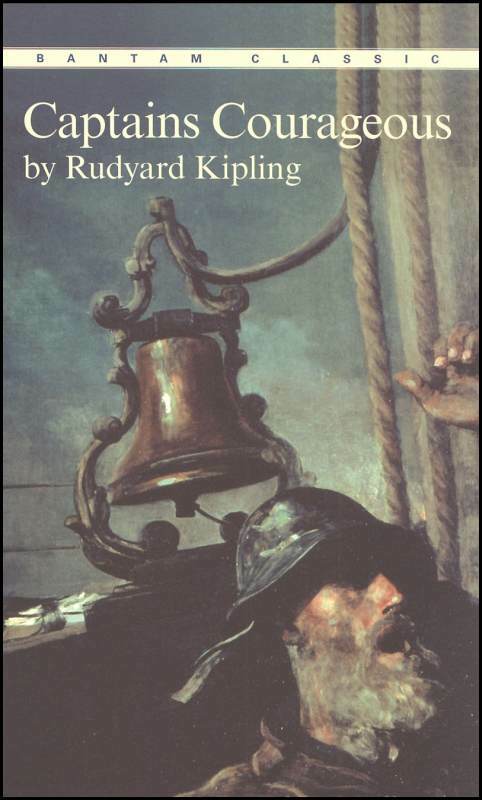 Today’s letter in the Really Like This Book podcast script reruns is K, for Rudyard Kipling, and a Kipling novel that has nothing to do with India, or the war, or about soldiers: three of his most well-known subject areas. Instead, it’s about the deep-sea cod fisheries off the north-east coast of Massachusetts. 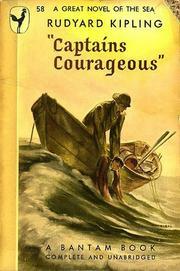 He published Captains Courageous in 1896, when he was living on the east coast of the USA, and wrote it partly to record a fast-disappearing trade, where schooners sailed into the Atlantic for the whole of the summer to follow the cod, and fish for them from little wooden boats lowered from the side of the sailing ships in all kinds of weather. He also wrote it as one of his stories of redemption, the saving of someone’s life, or character, by the experience of hard work, honest company, and egalitarian beliefs. It is a great read, not very long, and not particularly hard. Kipling delighted in writing dialogue in extreme dialect. Sometimes this can be impossible, and sometimes it’s easy, and this novel is one of the easier ones. It was made into a film in 1937 with Spencer Tracy and Freddie Bartholomew, but if you’ve ever read The Perfect Storm, or seen that film with George Clooney in it, this novel is about the same people and life, only a century earlier. Harvey Cheyne is a fifteen year old spoiled brat, the only son of a very rich railroad magnate. He is sailing to Europe with his mother, who lets him do anything he wants, when he is swept overboard from their liner in a not particularly rough sea. He is rescued by Manuel, a fisherman from the schooner We’re Here, and for the next three months he works his passage as a ship’s boy, learning to sail, to gut fish, to rig tackle, and to catch fish. He learns to value honesty and hard work, and his bored mind is happily put to work learning the complex art of navigation with a sextant. I like this novel for its atmosphere of fresh air and hard work. 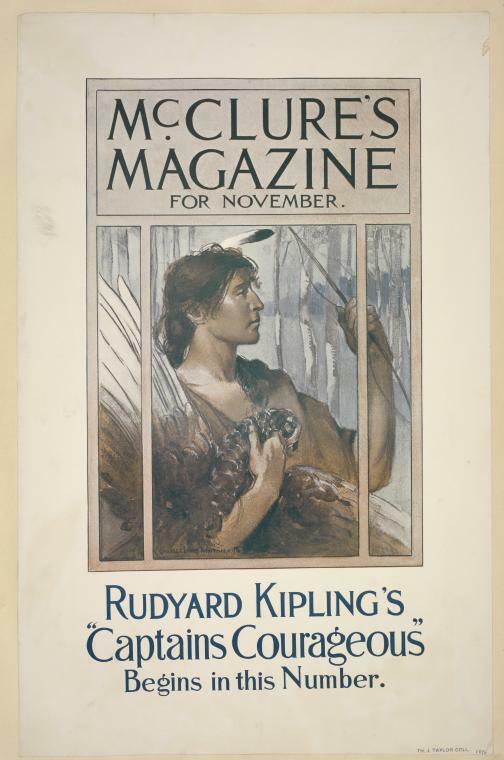 There is a heavy emphasis on work here, because this was one of Kipling’s main themes. He wrote a great deal about different trades and specialist professions: for this novel he researched sailing and fishing off the Grand Banks by talking to Gloucester fishermen. He learned the names of ropes, and the boat’s equipment and their uses, and he wrote down the dialect words he heard in conversation. But he didn’t go to sea with them himself, which is extraordinary, because you’d think from the novel that he’d done this trip many times himself. The daily routine is fishing and preparing the catch, eating and sleeping. There is occasional downtime when the fog was too thick, when the fishermen play instruments and sing in the tiny triangular cabin. Disko Troop is the ship’s captain, and a good master to Harvey: his son Dan becomes Harvey’s best friend. The ship’s other ship’s boy was washed overboard in an earlier storm, so Harvey’s arrival is fortunate for the crew. He earns ten dollars a week for his labour, and quickly learns to value this far more than the two hundred dollars a month he received from his doting mother as pocket money, in his earlier, useless life. Harvey’s education at sea shows him amazing sights. The sudden sinking of Uncle Abishai’s ill-fated ship is a terrifying and eerie event, caused by a drunken crew who don’t bother bailing their ship, or looking after the cracks in the keel. Harvey fishes in thick fog and blows a conch shell to keep in touch with the ship. He sees an iceberg wash slowly and silently by. He tries to translate for the crew when they meet a French ship who want to trade their tobacco for the Americans’ stores, but the language of Freemasonry does most of the talking. They nearly get run down by an ocean-going liner – the very kind of liner that the younger, spoilt Harvey used to travel in, talking ignorantly about what fun it would be to run a fisherman down. The We’re Here escapes from this nasty encounter, but the Jennie Cushman is destroyed under the liner’s keep, and only its captain is saved. He is bitter about being dragged to safety, telling Disko it would have been better if he had been left to drown, because then his widow could claim his pension, and he wouldn’t have to tell her that their son was been lost as well. Here one of the strangest episodes in the novel takes place. One of the We’re Here’s crew is Penn, a former Moravian minister who had lost his mind in shock at the death of his family in a flood many years before. He’s a gentle old man, slightly foolish, and taken care of by Disko’s brother. 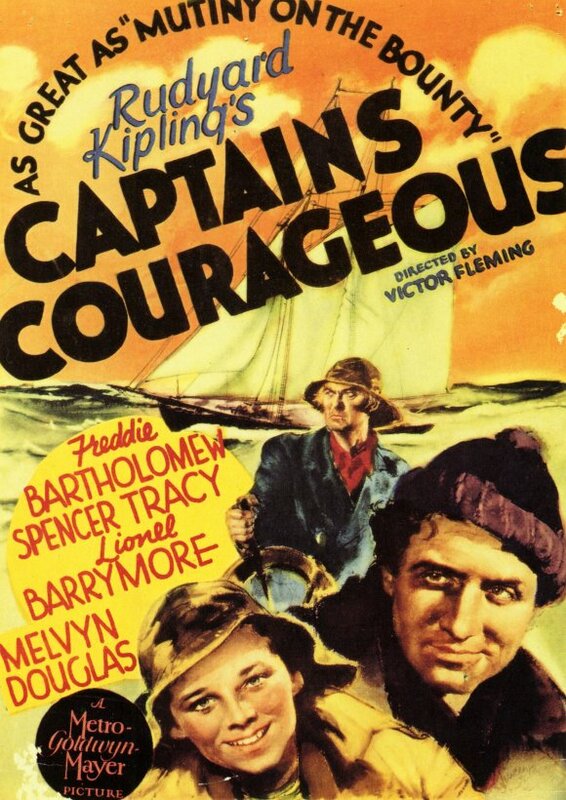 When the Jennie Cushman’s captain is hauled from the water, Penn suddenly transforms back into a preacher, takes charge of the broken captain and promises him that with God’s help, unlike Penn himself, he will find his son. The next thing we know, another schooner appears, and has the lost son, alive on board. Penn loses his former self, ‘his erect body sank like a sword driven home into the scabbard’, and he becomes again the foolish old man. 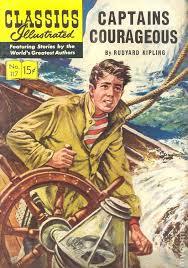 It is one of the most uncanny episodes Kipling ever wrote. Kipling can do horror as well. Harvey and Dan witness a burial at sea, and, later, Dan buys one of the dead man’s belts, because it has a knife attached to it that he wants to give to Harvey. They carry on fishing in the fog, and start pulling up a strangely heavy and unmoving fish, which is, of course, the body of the dead man, now no longer with a face. By buying the belt Dan brought bad luck on the ship, so they throw the belt with the body back into the sea. Back on their own ship, the cook discharges the boys’ bad luck with a sea-charm, a lit candle bobbing off to sea on its own little raft, with an offering of flour and water. This nameless cook is a haunting character. He has second sight, which gives him a status that requires respect. He’s a descendant of slaves from Cape Breton, and is, even more unusually, a Gaelic speaker with voodoo beliefs. 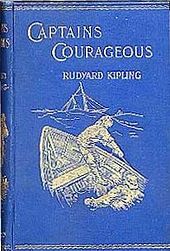 Kipling’s description of this character fits the culture of his time, with occasional use of the n-word in the dialogue that will offend readers who don’t understand historical context. But Kipling is also egalitarian: Disko most pointedly does not hold with slavery. The cook is treated with great respect on the ship, and is an equal, paid member of the crew. His seeing into the future adds gooseflesh to this story of boys and men on a very small boat in the middle of the deep green sea. Death is always close in this narrative. Gloucester has an annual memorial service to remember the sailors who died in the past year. When Harvey attends this, he realises that he has, in a way, taken the life of the other ship’s boy: one went in, the other was brought out. The understanding that he has been using a borrowed life completes his personal redemption. What remains in the novel is the redemption of his unhappy family. Anything by RK is amazing!